You’ve probably noticed an intrepid fly boldly navigating your pizza, lapping up oils and pizza sauce. Shortly after enjoying some of your meal, the fly, assuming it’s the kind with the lapping mouth parts, will have to throw it’s food back up and eat it again. If it’s walking on something solid, like your steak, it has to spit a digestive soup on it to help break it down. Lots of insects, flies included, aren’t so great at the whole digestion thing in their stomach – you know – that place where you’d think digestion ought to happen. Instead, to break down their food, these insects need their spit to help. 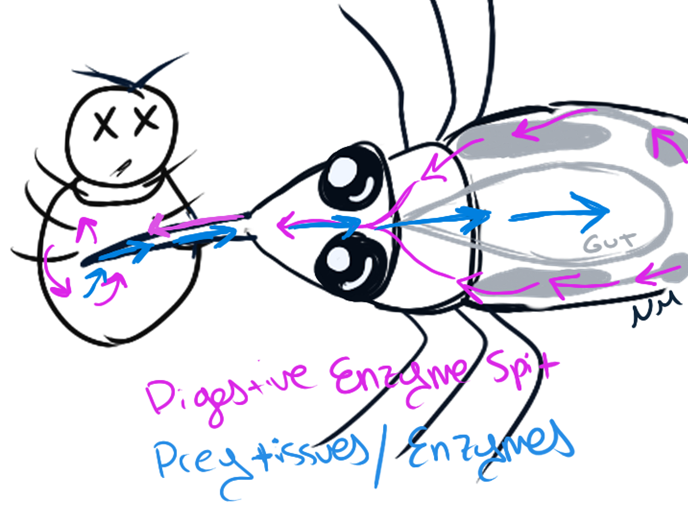 Some insects, like true bugs inject their digestive enzyme spit soup directly into the tissue of their food with their piercing mouthparts. Their spit concoction breaks down the plant or animal tissues and the bug slurps the resulting slushie back up through its straw-like mouth-bits. Yum. Flies with sponging mouthparts don’t have that luxury. So they lap up some delicious pizza oils, and have to spit it back out with the digestive enzymes. Then they lap it back up again to be fully digested by their midgut. Flies that eat things with high water concentrations will sometimes just hang some vomit off the tip of their tongue to let the water evaporate so they eat a more concentrated meal. 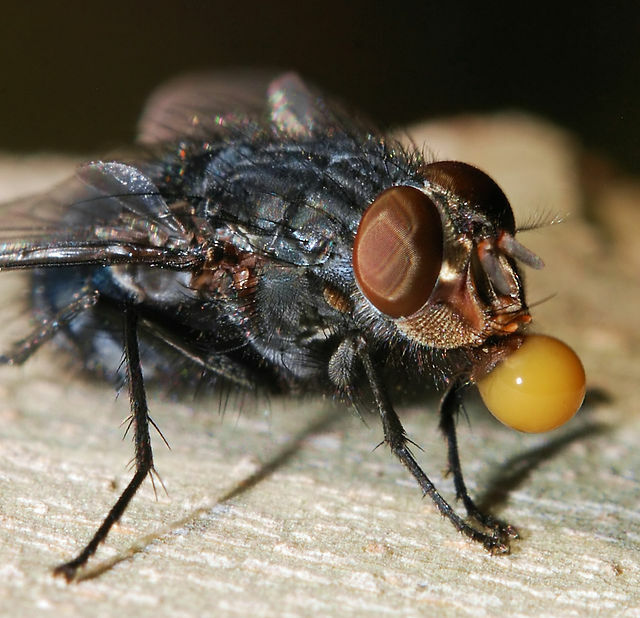 If the fly is trying to eat something solid, like your hunk of meat on your dinner plate, it has to spit on your food to break it down to something liquidy that the fly can eat. Sponging mouthparts of a blow fly. 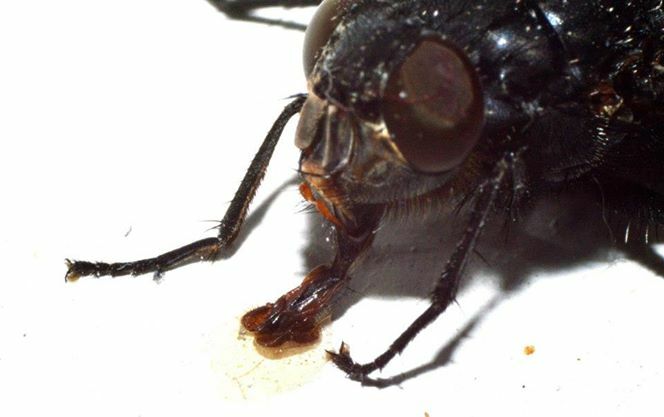 While fly vomit doesn’t immediately seem like it would useful, it’s important to the field of Forensic Entomology. Forensic entomology uses bug evidence to solve crimes. 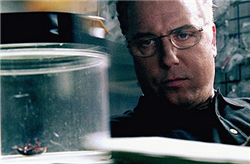 You’ve probably seen at least one example of this in your favorite TV crime show. Walk through a scenario with me. Imagine you find a dead body lying somewhere in your living room. Flies are the first ones to show up to the scene where feed on any exposed fluids and lay their eggs. If the body had been bloodied in any way, the flies will lap up the blood, fly the the nearest wall, puke it up, and then drink it again. This leaves a speckled pattern which looks an awful lot like blood splatter. This image is a combination of fly poop flecks and vomit spots on a wall. The vomit spots are the circular spots and the poop stains are the droplets with the tails. Therefore, it’s important for people who first arrive at the crime scene to know that flies can make patterns that look similar to blood splatter. 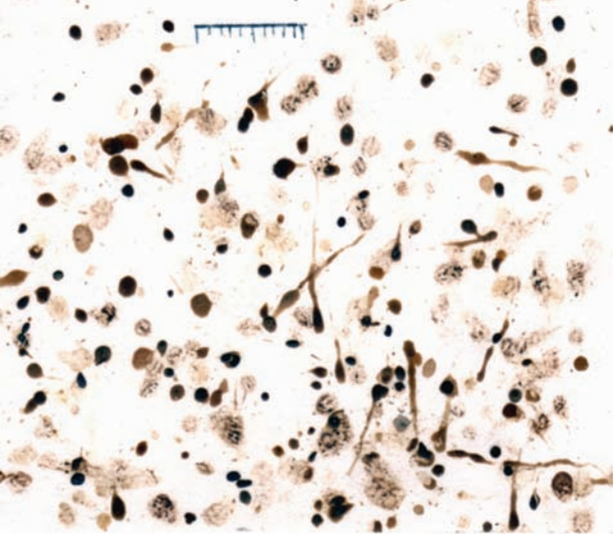 Other crime scene specialists are then needed to determine types of blood spatter and directionality of splatter patterns in addition to ruling out patterns caused by insects. That way they can help rule you out as a psycho, vindictive, murderer. This entry was posted in Behavior, Physiology and tagged Blood Splatter, Extra Oral Digestion, Flies, Fly, Forensic Entomology, Vomit. Bookmark the permalink. So if a flie bites you, does it also vomit where it bit?